There’s only one name you need to remember when you need a door replacement in Pensacola, Florida – Majors Home Improvement. We have served homeowners throughout the area since 1997, and it has been our mission from the beginning to deliver customer service that is second-to-none. We do this by offering premium products that last for decades, employing craftsmen who are experts in their fields, and providing personalized service from beginning to end. This commitment to our customers has earned us an A+ rating with the Better Business Bureau, as well as numerous industry awards. 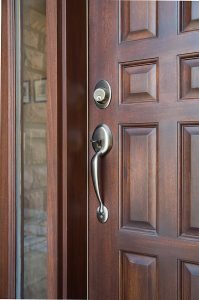 Beautiful – Our Majors Select™ Fiberglass Entry Doors are made with surfaces that resemble gorgeous wood-grain textures, like mahogany or oak. Energy efficient – Since our exterior doors have a solid polyurethane core, they provide excellent insulation by reducing heat transfer and air infiltration. Durable – These doors have engineered composite rails to eliminate the potential for rotting, chipping, or splintering, and a fiberglass skin that resists rusting. Plus, many of our doors meet wind and missile impact code requirements. Many times, homeowners are looking for a door replacement project to complement a window installation, and at Majors Home Improvement, we can complete both simultaneously at your home. Our Majors Select™ Vinyl Windows are energy efficient, durable, and available in all of the most popular styles. So, when you need a door replacement completed at your Pensacola, FL, home, Let Majors Do It! Contact us today to schedule a complimentary consultation.